I think before I got sick I didn't realize how often God actually allows us to endure the heat of the battle. I also didn't know how many battle scars come with that, but I can better see now how valuable those scars really are. I see how these scars, in the hands of our nail-scarred Savior, can be used for the purposes of His Kingdom, and to help others who are going through things we've already been through or have been dealing with for a very long time ourselves. And I see how our scars speak of where we've been, what we've been through, and our healing process. It's painful but precious in His hands. I heard Pastor Rick Warren say after the death of his son that we need more “wounded healers.” I totally get that, and I totally agree. Someone who has been there and done that has credibility like nobody else; we can deeply relate to them. Indeed, those somebodies who've kept on keeping on and persevered despite immense suffering; those who've continued to walk the long, arduous walk despite all the agonizing setbacks, detours, and obstacles. Somebody who's been in the rocky places, the scary places, the hellish places, the lonely places, the dark places, and the valley places. Someone who's not afraid to acknowledge the truth of their struggle or how hard it’s been. Somebody who's been in the dirt and the trenches. Somebody who's real and genuine. Yes, them; I want to hear from these people. I want to hear from those who've been on the front lines of the battle and are bruised up, banged up, and scarred up, but haven't given up. I want to hear from those who've lost a lot but still dare to hold onto hope. Those who've been hurt much yet still love more. Those who've been knocked down time and time again but still manage to get up over and over and over. These people have keen wisdom and insight, not only because of all they've endured (things most people will never fully know about) but also because they've allowed the Lord to work deeply in them and through their whole painful, ugly mess. They know suffering; they know hardship; they know brokenness, and they know God. They know how to lean on Him in hard times. They know how to trust Him, and they know how to dig in for the long haul. These are the ones who emerge from the smoky haze of battle, scars and all, as the true warriors this world so desperately needs. They might come out limping, or they might come out crawling, but they come out nonetheless. And they often help bring others out with them. They carry the true nature of an overcomer. They don’t make light of the battle, however. They don’t pretend to know it all or have all the answers. Instead, they're humble, compassionate, and resolute. They have developed a tough skin and a tender, brave heart - a servant’s heart. These are the people who will birth something beautiful from their messes, and a beautiful mess cannot be born apart from God. He’s the only one who truly knows how to birth beauty from pain and ashes. He’s the one who is birthing these battle-scarred heroes this generation is so needing. Perhaps you’re one of them. Maybe God is in the process of developing something uniquely beautiful in you to produce, reveal, and do what only you can. So please don't quit now because He won't waste what you're going through or experiencing. Hold on, dear ones. I know it hurts, I know it’s crazy hard, and I know you're weary. I know you cannot fully see where this is going, but I encourage you to hold onto the One who does know and understands suffering so well. Jesus - keep trusting Him. He's got you, even when it doesn't feel like it. He’s working deep and preparing you for your purpose. He's preparing you to administer healing and restoration to broken hearts, broken souls, and broken bodies. He’s preparing you to tell your story, and some people will desperately need to hear what you have to say because it will give them hope and inspire them to go on. 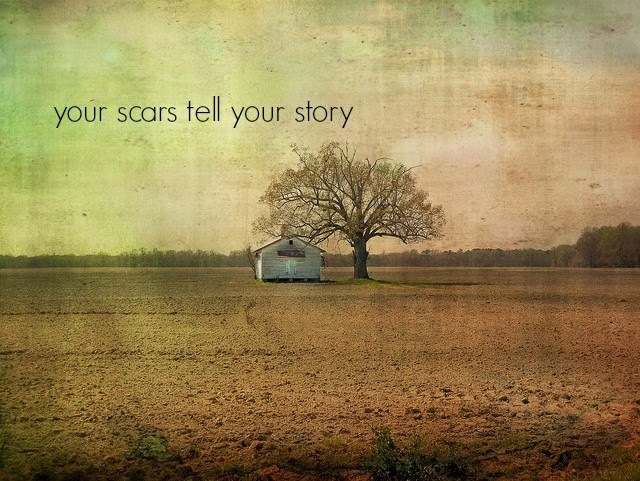 So when the time is right, share your scars well; they're the proof of what you've been through; they uniquely tell your story. And know this: your scars will one day encourage someone who is in the fight of their life - just like you are now.